So, who will join the men who came before in the most coveted of acting awards? That's the question offered to me by the great people over at The LAMB. This year's nominees are all, first, perfectly cast, brought in and allowed to shine as full collaborators in the passions of some of our finest filmmakers, even if one of them didn't quite work itself out as a great film. It was a great year for leading men, in general, with only two of these gentlemen making my personal lineup of the year's best five leading male performances. Chalamet is my personal choice. Day-Lewis would likewise make my list. It's a shame a few performances from smaller films missed. Adam Sandler's work in Noah Baumbach's "The Meyerowitz Stories..." got on my ballot in the film's first five minutes. Nobody did fiercely flawed anywhere close to the level of Robert Pattinson in "Good Time." And where is Jake Gyllenhaal? His work as Boston Marathon victim Jeff Bauman in David Gordon Green's "Stronger" is a masterclass in exhibiting both the most tenderness of love and the intensity of extreme fear and pain. That's not to say that Daniel K. and Denzel and Gary didn't do great work. All would make my top 10 or 12. But that's the way it is... We don't always line up with Oscar, but Oscar has certainly named five of the year's best performances to the pantheon of America's beloved cinema. Timothée Chalamet in "Call Me By Your Name"
Fully committed, lived-in work by a young actor totally inhabiting youthful lust and wonder in a film that seems to take those things as its primary themes. Chalamet contorts his body, wearing his own discomfort, the pain of desire and uncertainty permeating each long hour of the long buzzing summer of his experience. The way he reacts to Armie Hammer's Oliver, the range of emotions as he wavers among curiosity, attraction, need, is impressive in its authenticity. It informs the way he smokes that cigarette, hard, passionate, his obscure object dancing to the Psychedelic Furs. 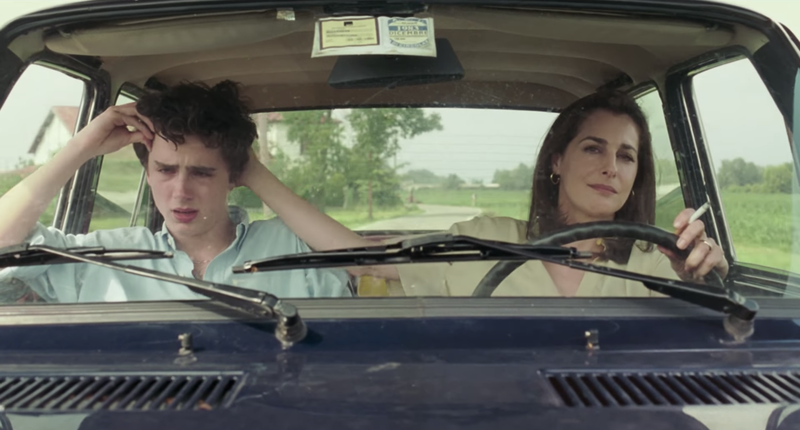 Timothée Chalamet's Elio is a character we love because he understands those of us who have felt that sort of longing that comes only when we're young. And his face in the final moment is the face of the young man who would get my vote if I picked a Best Actor in Leading Role this year. Daniel Day-Lewis in "Phantom Thread"
What more could we possibly get out of Daniel Day-Lewis at this point? Answer. The most. 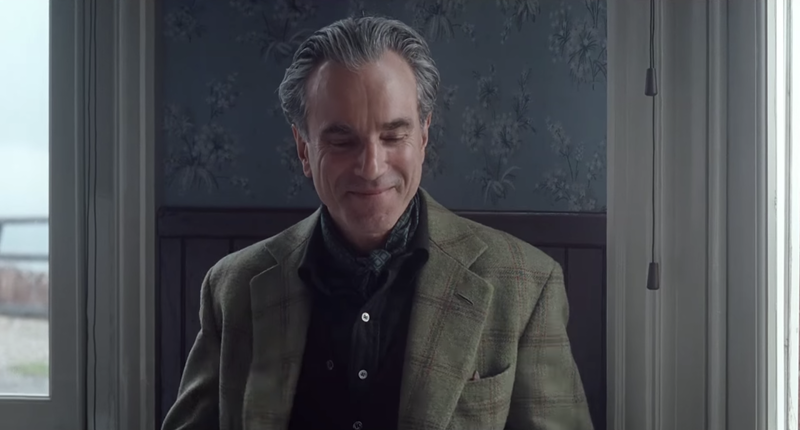 This is the performance of a true master in perhaps his swan song, a reunion with Paul Thomas Anderson in which he plays a 1950s London dressmaker angry with routine. It's a performance fully in tune with his director's vision, a portrait of the artist as an older man with certain needs he can't quite fill, demands no partner could manage, and the sort of negative idiosyncrasies only the strongest woman possible (or just the right one) could crack. Two women shape the narrative of Reynolds Woodcock, a fierce enabler of a sister Cyril, played by Supporting Actress nominee Leslie Manville, and Alma, played by an inexplicably un-nominated Vicky Krieps, his equal in every way. Daniel Day-Lewis' Woodcock is a difficult man, the sort of routined older man we all hope-we-don't-but-probably-will become, viciously annoyed by the forks on teeth, knives on toast, tea when its not time. And his ability to manner that anger is case and point for his place as the Best Actor maybe ever...and a perfectly deserving nominee. Daniel Kaluuya in "Get Out"
There's a tentativeness to Kaluuya's work as Chris, the unwitting, if a tad suspicious, boyfriend to Allison Williams' Rose. And he carries that guard through the entirety of Jordan Peele's surprising debut. Kaluuya keeps us in lockstep through every shift in tone, every mind-blowing development. He seems always a bit on edge, like a boyfriend meeting the parents for the first time or a man trapped in a house of horrors unimaginable. There's also a lot to his face, now forever burned in the collective movie memory, tears flow from eyes wide open, memory, pain, and fear, quite literally "sinking" into his circumstance, trapped. "Get Out" is something. It's a movie that still eludes me to some extent, one that demands endless re-watches and seems to change in subtle ways each time I watch it. On first watch, Kaluuya didn't seem to do much at all, just as the film didn't. On re-watch, it seems this movie becomes something else entirely, and Kaluuya's performance likewise becomes the gift that keeps on giving, Best Actor work in a film nobody saw coming and that we may never get again. 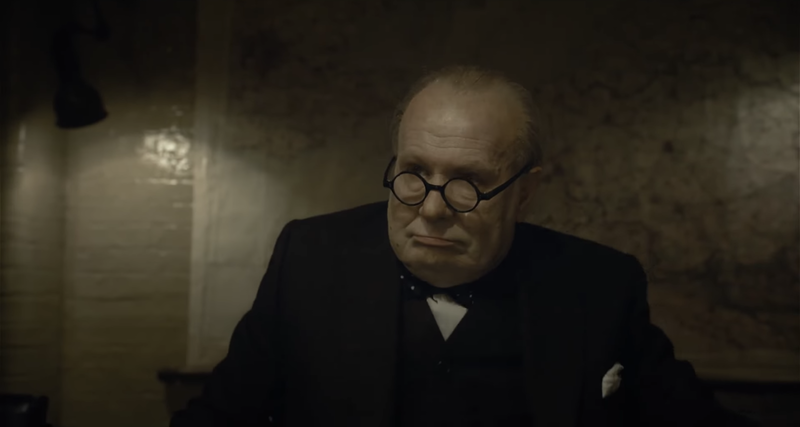 Gary Oldman in "Darkest Hour"
The outlier is also the loudest, the biggest, the heaviest, the clear winner. A lifetime achievement award for one of the most interesting actors of my lifetime. We often praise actors in terms of how well they disappear into the role. Oldman quite literally disappears (fat suit and prosthetics and makeup galore) into the larger-than-life Winston Churchill in his first days as Prime Minister. And so I dismissed it all as this year's "Iron Lady" and waited and waited to get to it. Then, I got to it. And it is proof of at least two things: 1.) Director Joe Wright is great at making movies; and 2.) Gary Oldman is a maniac casting choice that so works. He's got the loud, maybe drunk, cigar clouded thing down. He's got the loud, demanding, staunchly correct, speech-making thing down. And, and this is the very best, he has the small moments of pain, silent fear creeping in, despair for the loss of his country's sons, desire to find his way back to the people, his people. These are too the moments where you see Oldman's face buried in there, and you see how well that works just the same. Despite all that, I prefer nearly every other nominated performance, but I can live in a world where this performance wins Best Actor. Denzel Washington in "Roman J. Israel, Esq." If all of this movie was as good as its first act, I might champion this performance as the best of the year. Alas, Dan Gilroy's screenplay or whatever it got turned into after filming and editing is epically flawed, manipulative, and turns what seems to be the perfect activist hero for our collective now into a man that doesn't resemble anyone that anyone knows. 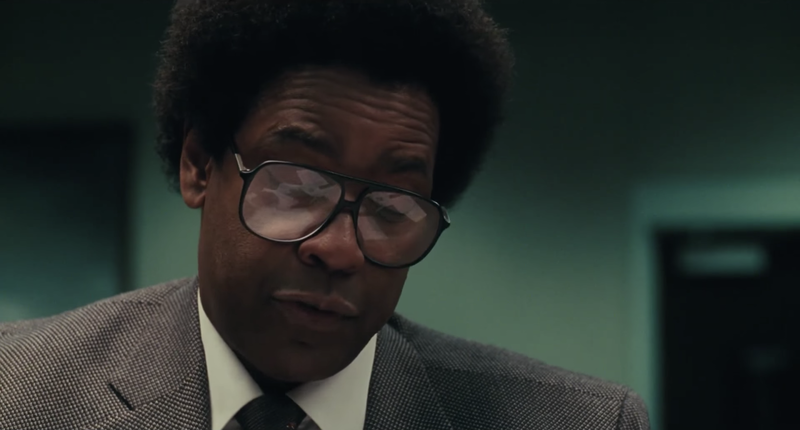 But Washington brings out the tics, the inner-workings of a man like Roman J. Israel, Esq. are fully brought to life, a man of massive intelligence, socially inept, too intense in his convictions to ever be more than a law office's chief researcher. And that's the first act, and, when the movie tries to make him more, so it loses us little by little. Even so, Washington never wavers and takes this character to that point and past. It's a committed performance from one of the greats that could never be played by anyone else. And there's something to be said for that, even if this performance has no chance of winning Best Actor. A shame too. I'd like to see Denzel get another statue, especially on the heels of such stellar work in 2016's "Fences." Oldman is great, and the movie itself is quite good. People, I think, just get tired of the bait-y historical biopic. This is actually a really well-made one that is quite entertaining. Oldman is the reason for that. My favourites (Franco, Jackman and Pattinson) were snubbed so I don't really care about who wins this year. That said, I'd love if it was Daniel Kaluuya. His is my favourite performance of the bunch. I didn't like Chalamet's that much but I'd take his win over Oldman's. He was great as Churchill but he doesn't deserve the award and I'd love to see him lose to a younger actor. I liked Franco fine, but that movie just didn't totally work for me and that lost him some steam for me. Jackman is great, but I just don't see it as Oscar-worthy. Kaluuya would be cool. Chalamet would be GREAT. Oldman just has it on lock. This is a strong lineup even if it's not the five I would choose (which is true of most of the categories this year). I respect Oldman's work but liked it the least - it's all far too easy, and I almost never got anything that wasn't in the script to begin with. The speechifying and physicality are all good, but there's precious little else there. I didn't get much out of DDL's performance either, but I think that's much more a failing of the script, which keeps certain realities of Woodcock's life a mystery (or merely offscreen) when the film would be so much more interesting if they were addressed. Of course, he's also COMPLETELY overshadowed by Manville and Krieps, so there's that. The other three would make my personal shortlist easily. Kaluuya's face is so expressive - even and perhaps especially in its non-expressiveness - and he's the key to making Get Out work as well as it does. For once, a protagonist in a horror film that is truly worth rooting for. Washington's performance is a wonder, so quiet and subtle where most other actors would go big and loud, and even though the film lets him down spectacularly, he goes a long way towards making it believable. None of them can touch Chalamet's work, though. What a freaking beautiful performance in a beautiful film. I continue to be unable to form coherent sentences about Call Me By Your Name and how I feel about it, but his work is just tremendous. Chalamet is far and away the best male performance of the year. I've honestly never seen anything quite like it. I think Phantom Thread is just about as perfect as movies get. I knew all I needed to know about Woodcock. I would say more matched by the female performances than overshadowed. Krieps is unreal. She got hosed. If I had a ballot for Best Actor, only 3 of the actual Best Actor nominees would make my ballot (Chalamet, Day-Lewis & Oldman). Kaluuya just misses the cut, & Washington is not too far behind him. In their places, I would nominate Steve Carell for Last Flag Flying & Ryan Gosling for Blade Runner 2049. (I will say, that after rewatch, Roman J. Israel, Esq. is a much better film than when I first saw it). Here, I'd go Day-Lewis (as my personal winner), followed by Chalamet, Oldman, Kaluuya & Washington. Oldman will probably win, but I hope Day-Lewis pulls off an Adrien Brody & takes home his 4th Oscar. Gosling would be an interesting choice. Never got to Last Flag Flying. I'd be fine with Day-Lewis. Oldman will win this though. I think Chalamet should be winning the Oscar this year, tbh. In terms of range of emotion, I think he just had more to do than the other nominees. (Though Kaluuya is my favorite because of Get Out) I still haven't seen Washington's movie yet. I'm still bitter about Franco missing out. Agreed. He is unreal. Franco was great, but that movie just didn't work like I hoped it would. Nice breakdown! I love what you said about Day-Lewis' character... "angry with routine..." I've heard that before but it is absolutely perfect. And I agree that Oldman has this on lock, which I'm not mad about at all. Thanks! "Angry with routine" is how I would describe by late paternal grandfather. He didn't like to be fucked with and made it well-known. He could also be the most charming guy ever. I connect with DDL's work there. I'm actually good with Oldman too. It's great owrk.